Thonburi (Thai: ธนบุรี) is a vast district that consists of the entire west bank of the Chao Phraya River in Bangkok. After the sack of Ayutthaya in 1767, General Phraya Taksin made Thonburi the new capital of Siam for a brief period of time. It is hard to believe this was once the country's capital, as the district is devoid of the grand structures seen in other former capitals. In fact, Thonburi stayed relatively isolated from Bangkok proper, and for centuries was an agricultural land filled with canals and fruit orchards. While Thonburi has quickly developed in recent decades, most visitors still come here for the cool and peaceful atmosphere. The traditional Thai way of life on the canals still exists here, as do the floating vendors and orchard farms. Originally, "Bangkok" referred to a village in the area that today roughly corresponds to the neighbourhoods of Bangkok Noi and Bangkok Yai. At that time, the Chao Phraya River had a completely different course than it does today. The Chao Phraya had a horseshoe shape that is similar to the current course of the Bangkok Noi and Bangkok Yai canals. One theory on the origin of the name is that Bangkok came from "Bang Ko", which means "island village" in Thai, referring to the village that was almost completely surrounded by the Chao Phraya River. Bangkok was the first part of Thonburi to be settled, as its location was a convenient storage point for trade ships that sailed north towards Ayutthaya. The horseshoe shape of the Chao Phraya River slowed down trading ships, and in 1542 a small canal was dug across the base of the meander to shorten sailing time. The strength of the current eroded the canal's banks, and over time the new canal became the main course of the river. 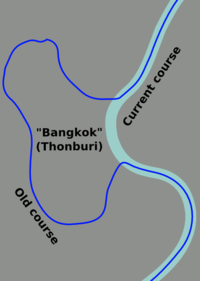 Bangkok was on the east bank of the old course of the river, but on the west bank of the new course. As sailing times quickened, Bangkok became a tax collection port and customs office for foreign traders sailing to Ayutthaya. In 1665, King Narai the Great ordered the construction of Vichaiyen Fort near the mouth of the Bangkok Yai canal to protect Ayutthaya from foreign invasions. This fort is now known as the Vichaiprasit Fort and can still be seen from the Chao Phraya Express Boat today. With it, the village got the status of fortified city and was renamed Thonburi. When the city of Ayutthaya was burnt to the ground by Burmese armies in 1767, General Taksin was in charge of the resistance. A capable military leader, he conquered back Siam within a year and took hold of large parts of Southeast Asia in the following decade. He became King of Siam and established Thonburi as the new capital of the country. He created his palace close to the fort, while the residence of General Phraya Chakri (who would later become King Rama I) was near the current location of Wat Rakhang. In 1779, King Taksin had proclaimed himself a sotapanna (or divine figure), striking against the will of the powerful Buddhist monkhood. The state was in economic turmoil, there was rampant corruption and famine struck the country. King Taksin tried to maintain order with harsh punishment and purges. When General Phraya Chakri was fighting out a war with Cambodia, a rebellion took hold of Thonburi, forcing King Taksin to step down. Shortly after, he was secretly executed. When General Phraya Chakri returned, he was offered the throne and became King Rama I, the first King of the Chakri dynasty. He made Rattanakosin the new capital of Siam, as he believed that city would be easier to defend against foreign invasions. This was the end of a brief era now known as the Thonburi Period. However, this wasn't the end of "name Bangkok." Foreigners never adapted to the changes and kept using the name, and even though it's technically incorrect, Bangkok remains the name non-Thai speakers use to refer to Krungthep. 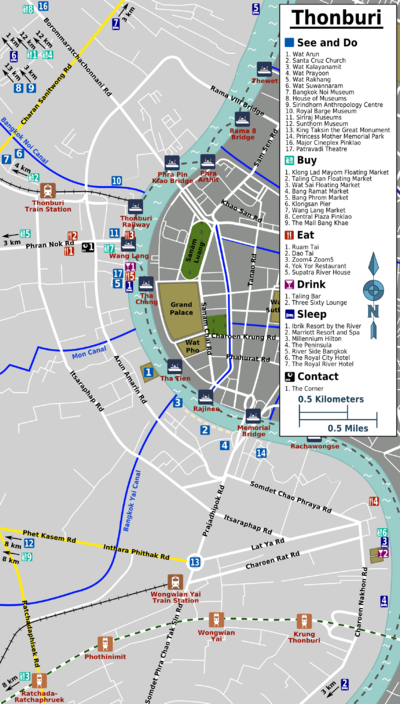 Thonburi stayed relatively undeveloped compared to its neighbour across the river. The economy was mostly agriculture-based with fruit orchards criss-crossed by canals. Many durian species have originated in Thonburi, including mon thong, chanee and kan yao. Most of the fruit orchards have disappeared as Thonburi became more developed. It wasn't until 1932 that Thonburi became physically linked to the Rattanakosin side with the construction of the Memorial Bridge. Thonburi remained a separate entity until 1971, when it was incorporated into the city of Krung Thep (Bangkok). The easiest way to get into Thonburi is by boat. The Chao Phraya Express Boat goes up and down the river for 15 baht. Sometimes cashiers want you to buy the ticket before embarking the boat, but it is allowed to buy tickets inside. If going north from Sathorn pier (from Silom), the first pier on the Thonburi side is Wang Lang. It's the easiest point of entry as all lines stop there and the Wang Lang area is one of the more interesting ones in Thonburi. If you're heading south from Phra Arthit pier (from Khao San Road), Wang Lang is the second pier on the Thonburi side. When you're heading for the Royal Barge National Museum, disembark at the Phra Pin Klao Bridge pier. There are also numerous ferries crossing the river from the Rattanakosin and Silom sides. Many Bangkok commuters make use of these ferries, as they quickly cross the river for only 3 baht. If you're visiting Wat Arun, head for Tha Tien pier at the Rattanakosin side and embark take the Wat Arun ferry service. Other notable ferry services are from Tha Chang to Wang Lang and from Tha Phra Chan to Wang Lang. Most travellers will visit Thonburi as a day-trip from Khao San Road, Sukhumvit or Silom. After nearly ten years of delays, the BTS Skytrain connection to Thonburi finally opened in May 2009. The only two stations on the Thonburi side (Wongwian Yai (S8) and Krung Thonburi (S7)) aren't near anything particularly interesting though. The best way to get into Thonburi is by getting off the Skytrain at Saphan Taksin station, near the end of the Silom Line, and taking the Chao Phraya Express Boat up the river. The BTS Skytrain Silom line is being extended westwards. As of 14 February 2013 it is operational as far as Talat Phlu (S10) but you will need to change at Wongwian Yai (S8) to catch the shuttle train that runs between those three stations (S8,S9,S10). Getting into Thonburi by bus is very complicated, so only use city buses as a last resort. Bus travel is necessary to reach some destinations though, such as the Taling Chan Floating Market. If heading there, take ordinary and air-conditioned bus 79 from Ratchadamnoen Klang Road, which is near Khao San Road. Make sure you take the bus into the right direction (crossing the river) and ask local passengers when to get off or you might get lost. Thonburi is a vast district, and getting around it is not easy. The area can hardly be explored on foot, as sights are spread far off throughout the district, most of the main roads are heavily congested with commuters and the area is lacking foot bridges over its numerous canals. This is why most travellers take a canal tour (see the Do-section). But this doesn't mean the area cannot be experienced on your own at all — most of the roads can be walked on, and footbridges do exist, just don't say you haven't been warned. Wat Arun (วัดอรุณ), also known as the Temple of Dawn, is an iconic temple at the west bank of the Chao Phraya River, right next to the Navy Base. This is a royal temple in the highest rank and it is by far the most visited tourist attraction in Thonburi. It is easily accessible with the 3 baht ferry boat from Wat Pho in Rattanakosin. Ferries take off about every 10 to 15 minutes and operate daily from 06:00 till about 22:00. Walking around the temple gardens and looking at it from a distance is free, but if you want to enter the temple compound and climb the steep stairs, it costs 50 baht (for foreigners at least). Entering the complex can be recommended, as otherwise you won't see the small porcelain pieces it is decorated with. The temple grounds are opened from 07:30 till 17:30. Thousands of foreign tourists visit the temple everyday, many of them by canal tour early in the morning. A temple has occupied this site since the Ayutthaya Period. It was first named Wat Makok, which means "Olive Temple", named after the many olive orchards in the area. After the fall of Ayutthaya, General Taksin was at war trying to conquer Siam back from Burmese armies. When he arrived in Thonburi in the morning, he reputedly saw this magnificent temple during sunrise. Since then, the temple got the name Wat Chaeng or Wat Arun, which means the Temple of Dawn. Wat Arun served as King Taksin's royal temple and was inside the Wang Derm Palace grounds, his personal residence. In the Thonburi Period, Wat Arun housed the recaptured Emerald Buddha for several years, before it was moved to the Grand Palace in Rattanakosin in 1785. In the Rattanakosin-era, Wat Arun lost its special status to Wat Phra Kaew in the Grand Palace, but it remained one of the most iconic temples of Thailand. It is featured prominently on 10 baht coins and as the logo of the Tourist Authority of Thailand (TAT). 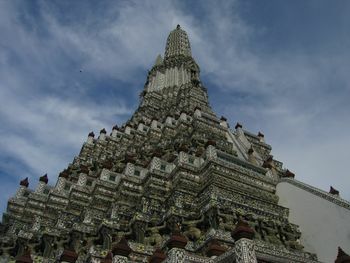 The magnificent main prang is in Thai called the Phra Prang Wat Arun. Overlooking the Chao Phraya river, it is not only the symbol of Thonburi, but a world-famous landmark and one of the most photographed icons of Thailand. The prang was originally built during the Ayutthaya Period and is in a classic Ayutthayan style. It was reconstructed and enlarged during the reign of King Rama II, and was completely finished in the reign of King Rama III. The height is reported by different sources to be between 66 and 86 metres. It was the tallest structure in Bangkok until the advent of the modern skyscraper. The main prang and its four satellite prangs are beautifully decorated with colourful broken Chinese porcelain pieces. It is believed that these broken porcelain pieces come from Chinese trade ships that were shipwrecked at sea. Steep steps lead up to two terraces that surround the prang. From there, you have a nice view of the Chao Phraya River with the Grand Palace, Wat Pho and even downtown if you look far enough. Beside the famous central prang, be sure to take a look at the main chapel, the image hall, the Chinese style bell tower, and the open pavilions overlooking the river. Wat Bang Mod is a big and famous temple. It's located at Moo 4, Soi 33, Pracha Utit Rd, Bangmod, Thungkru BKK 10140. Bus number 140 goes from Victory Monument to Soi 27 in Pracha Utit Road. This temple allegedly has piece of Buddha’s bone, which attracts many Buddhists. It also has a school that teaches Pali language and grammar. Many tours through Thonburi's backwaters include a visit to the so-called Thonburi Snake Farm. Besides a snake show performance, it is also a small zoo with a number of animals kept in cages for the purpose of entertaining tourists. (Closed down permanately 5/2016) Conscious travellers might want to know that the animals in this snake farm live in very bad conditions and in small cages. There are no signs to inform the visitor, as the animals are only meant for the sole purpose of entertainment. If you don't want to visit the farm for these reasons, make sure you book a canal tour that does not include the farm. For an alternative, visit the animal friendly Queen Saovabha Institute Snake Farm in Silom. Nineteenth-century Bangkok was laced with canals, giving the capital the designation "Venice of the East". As Bangkok turned into a bustling metropolis, Thonburi's surviving canals and the Chao Phraya River provide memorable vignettes of the traditional waterborne way-of-life that once was. No wonder then that most travellers visit the district by boat. Many of the tours and floating markets feel pretty set-up though, but in mornings you might still encounter an authentic floating vendor, paddling from house to house trying to sell some just-prepared food. The most convenient option is to take a fixed-price trip, which is a package deal that usually includes a visit to Wat Arun, the Royal Barge Museum and a floating market. Such a tour can be booked through a travel agency, but it's easier to go to the pier yourself. There are two tour companies, one operating from Tha Chang pier in Rattanakosin, the other operating from Si Phraya pier in Silom (near River City shopping centre). Trips can also be arranged by chartering a boat along the canals at the east side of the river. The most convenient place to do this is Tha Chang pier or Tha Tien pier at the Rattanakosin side of the river. But it's also possible at Oriental pier in Silom and at the Bangkok Information Centre under Phra Pinklao Bridge (near Khao San Road). Major canals in Thonburi which tourists can take a boat trip through are the Bangkok Noi canal, Bangkok Yai canal, Daan canal and Chakphra canal. Be prepared to bargain, but don't pay more than around 1,000-1,500 baht for a two-hour trip (without any stops). Another option is the boat service from Tha Chang pier. It operates every morning from 06:30 till 11:00 and departs every half hour (or when it has enough passengers). Boat fare is only 30 baht per person and you'll visit an orchard and a floating market. If you want to eat like the locals, or if you are on a budget, head for Wang Lang Market. The main roads and their side streets are filled with plenty of unnamed restaurants and simple carts selling meals for less than 50 baht. It is known as one of the best places in Thailand to get food from Southern Thailand. The story goes that Southern Thais settled in this area as trains from the south used to arrive at the Thonburi Train Station nearby. The Bang Ramat area has plenty of cheap budget eateries as well, very convenient in case you're waiting at the Southern Bus Terminal. Just walk down Phuttamonthon Sai 1 Road and you will find plenty of restaurants, especially at the intersection with Ban Suan Phutthamonthon Road and the intersection with Wat Kaeo-Phutthamonthon Sai 1 Road. They offer traditional Thai cuisine, Thai and Western-style desserts and refreshments. Most delicacies on sale won't cost you more than 25 baht. 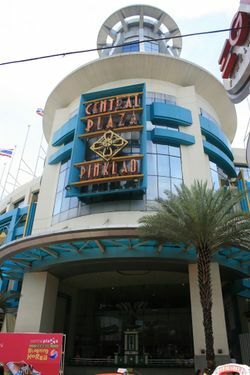 Central Plaza Pinklao is a good alternative if you're looking for mid-ranged chain restaurants, such as Yayoi and Sizzlers, or even the usual Western fast food chains. If you're elsewhere in Thonburi, hawker stalls are all over the district, as are 7-Eleven convenience stores. Do not expect a big nightlife scene in Thonburi — for that, the other districts in Bangkok do a better job. There are some dive bars spread over the area, but most of them aren't really interesting unless you want to experience how the locals go out. Finding a place to go online is not an easy task in Thonburi. It is mostly a residential neighbourhood and most Thais have an internet connection at home. You might want to ask around with the locals. There are some Internet cafes along Phran Nok Road, such as The Corner CoffeeShop & Internet near the Wang Lang area. Take the train from Thonburi's Wongwian Yai Station to the fishing village of Maha Chai. Trains leave hourly and the trip takes about one hour. The train ride is an attraction in itself, with plenty of orchards, vegetable plantations, and coconut groves to see. Maha Chai is a great destination for fresh seafood. If you wish, you can even continue your trip to Samut Songkhram from there. Drive 15 kilometres west along Phetkasem Road for the Rose Garden in Nakhon Pathom. Get away from the hustle and bustle of Bangkok and experience the Thai rural way of life with beautiful gardens and orchards. It is a retreat into a peaceful environment, except at 14:00 when the tour buses and coaches kick in for the daily Thai Village Cultural Show (worth it though). This page was last edited on 7 April 2019, at 15:00.